The Atlantic Forest (Mata Atlântica in Portuguese) is a region of tropical and subtropical moist forest, tropical dry forest, tropical savannas, and mangrove forests that extends along the Atlantic Ocean coast of Brazil from Rio Grande do Norte state to Rio Grande do Sul state, and inland as far as Paraguay and northern Argentina. In northeastern Brazil it occupies a thin coastal strip less than 40 miles wide, while in the south it extends as far as 200 miles inland. Because of its isolation from the Amazon Basin by a drier region to its west, the Atlantic Forest contains many distinct plant and animal communities. For example, about 92 percent of the amphibians are not found anywhere else. Many of these endemic organisms persisting in patches of forest are all that remain due to centuries of deforestation for agriculture and urban development. Of the more than 386,000 square miles (1 million sq km) of original forest that are believed to have once covered the coast of Brazil, only an estimated 7 percent survived. Although a small portion of its original size, what remains is among the most biologically rich and diverse forests in the world. In 1999, recognizing the importance of its conservation, UNESCO declared 432 square miles (1120 sq km) in eight separate areas of the forest in coastal northern Brazil a World Heritage Site. The organization deemed this acreage to be an irreplaceable part of the world’s forest heritage and of great interest to science. Working together, scientists and conservationists, with the support of private industry, seek additional means to preserve and extend the protected areas. The Azure Jay is common in the Atlantic Forest. Around 2,200 species of birds, mammals, reptiles, and amphibians live in the Atlantic Forest, including nearly 200 bird species found nowhere else. Of the 26 species of small primates, most are only found there. These include the golden-headed lion tamarin (L. chrysomelas), black-faced lion tamarin (L. caissara), black lion tamarin (L. chrysopygus), and the highly endangered golden lion tamarin (Leontopithecus rosalia). Other mammal species include the muriqui or woolly spider monkeys (Brachyteles arachnoides) and the maned sloth (Bradypus torquatus). Birds include the red-necked tanager (Tangara cyanocephala), the red-billed currasow (Crax blumenbachii), seven-colored tanager (Tanagara fastuosa), blue-bellied parrot (Triclaria malachitacea), and the three-toed jacamar (Jacamaralcyon tridactyla). The forest is also home to around 20,000 species of plants, and new species continue to be discovered. The Amazon Institute is active in reforestation efforts in the northeastern state of Pernambuco, Brazil. During 2007, 5,500 new trees were planted in the mountains, adding to what little remains of the ancient forest. The Nature Conservancy, its Brazilian counterpart, and several corporations are involved in reforestation and forest management projects in the south. During glacial periods, however, the Atlantic Forest is known to have shrunk to extremely small refuges in highly sheltered gullies, with most of the land area being occupied by dry forest or even semi-desert. Some maps even suggest the forest actually survived in moist pockets well away from the coastline, where its endemic rainforest species mixed with much cooler-climate species. Caatinga enclaves moist forest during the rainy season. The Atlantic Forest region includes several variations of forests. Coastal restingas—low forests growing on stabilized coastal dunes. Coastal forests, also known as Atlantic moist forests are evergreen tropical forests with structures. Interior (inland) forests, also known as the Atlantic semi-deciduous forests—where many trees drop their leaves during the dry season. Atlantic dry forests farther inland—forming a transition between the arid Caatinga to the northeast and the Cerrado savannas to the east. Montane moist forests—occur in the Serra do Mar and across the mountains and plateaus of southern Brazil; are home to Araucaria and evergreen trees of the laurel (Lauraceae) and myrtle (Myrtaceae) families. Shrubby montane savannas—occur at the highest elevations. The variety of forest contains multiple canopy levels that support a diverse mix of vegetation, including many types of ferns, mosses, and epiphytes (plants that attach to other plants) such as orchids and bromeliads. The Atlantic Forest is unusual in that it extends as a true tropical rainforest to latitudes as high as 24°S. This is because the trade winds produce precipitation throughout the southern winter. In fact, the northern Zona da Mata of northeastern Brazil receives much more rainfall between May and August than during the southern summer. The Atlantic Forest is now designated a World Biosphere Reserve because it contains a large number of highly endangered species, including the well-known marmosets and lion tamarins. It has been extensively cleared since colonial times, mainly for the farming of sugar cane and for urban settlements. Tropical and subtropical moist broadleaf forests—Also known as tropical moist forests, these are a tropical and subtropical forest biome and can include tropical rainforests, moist deciduous and semi-evergreen seasonal forests, montane rain forests and flooded forests. Typical vegetation in the Pernambuco coastal forests. Mantiqueira Mountains in the Campos Rupestres montane savanna. Tropical and subtropical dry broadleaf forests—These are alternately known as the tropical and subtropical dry forest biome or the tropical and subtropical deciduous forest biome. In some locales these are also called monsoon forests, and they tend to merge into savannas. Tropical and subtropical grasslands, savannas, and shrublands—These are a grassland biome located in semi-arid to semi-humid climate regions of subtropical and tropical latitudes. Grasslands are dominated by grass and other herbaceous plants. Savannas are grasslands with scattered trees. Shrublands are dominated by woody or herbaceous shrubs. Mangroves—These generally consist of trees and shrubs that grow in saline (brackish) coastal habitats in the tropics and subtropics. Logging, agriculture, and the clearing of forests to create pastureland create jobs but also threaten the forest's longevity. In the south, Asian water buffalo are raised on land cleared from the forest. The Nature Conservancy and affiliated conservation organizations are working to help local residents balance their economic activities with improved forest management. Sustainable development activities may include ecotourism, organic agriculture, ornamental and medicinal plant production, and craft production for the growing number of tourists. New employment opportunities include working as park wardens and in reforestation efforts, carbon monitoring, and infrastructure development. Two of the world's largest cities, Rio de Janeiro and Sao Paulo, lie within the Atlantic Forest ecoregion. Protecting biodiversity while meeting the needs of growing metropolitan and rural populations is a serious challenge. Logging, agricultural expansion, and associated road building threaten the forests in this region, while habitat loss, hunting, and the wildlife trade threaten many species. The Nature Conservancy, American Electric Power, General Motors, Texaco, and Sociedade de Pesquisa em Vida Selvagem e Educação Ambiental (SPVS) are jointly sponsoring the Guaraqueçaba Climate Action Project aimed at protecting and restoring over 30 million acres of threatened and degraded rainforest in southeastern Brazil. By abating the accumulation of carbon dioxide in the atmosphere, the project is expected to have a positive influence in mitigating global climate change. The probability of species extinctions is high without intensive conservation efforts. Relatively extensive but generally unprotected blocks of forest remain in the southern portion of the eco-region, particularly in Argentina and Paraguay. Conservation International. Biodiversity Hotspots: Atlantic Forest. Retrieved January 7, 2009. Galindo Leal, Carlos, and Ibsen de Gusmão Câmara. 2003. The Atlantic Forest of South America: Biodiversity Status, Threats, and Outlook. State of the hotspots. Washington: Island Press. ISBN 9781559639897. The Nature Conservancy. 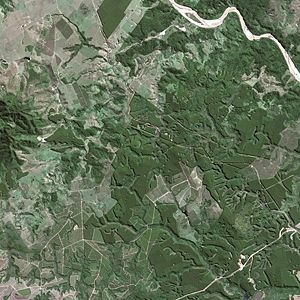 The Places We Work: The Atlantic Forest of Brazil. Retrieved January 7, 2009. UNESCO World Heritage Centre. UNESCO: Discovery Coast Atlantic Forest Reserves. Retrieved January 7, 2009. World Wildlife Fund. Atlantic Forests—A Global Ecoregion. Retrieved January 7, 2009. This page was last modified on 23 April 2016, at 20:52.